Since my homemade Nutella recipe did so well, I decided to share another healthy chocolate treat for you. 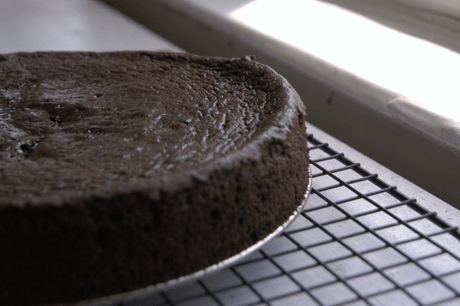 This flourless chocolate cake is rich, fudgy and free from refined sugars and flour . It only takes 5-ingredients to make and it’s definitely more decent than most cakes out there! Preheat the oven to 190C and then grease a 8″ pan with coconut oil. Put the chocolate in a safe-oven bowl and melt in the microwave until completely smooth. Combine the melted chocolate with the cocoa powder, honey and eggs and then whisk well until you have a smooth batter forms. Pour the batter into the greased pan, and then smoothen the top of it with a spatula. Bake at 190C for 20-25 minutes. Once the centre looks firm, remove it from the oven and then allow to cool in the pan for 15 minutes. Remove the sides and allow to cool completely before serving.